luggage protection | Badudets Everything Nice! Do you get paranoid that airport staffs and customs officers peek into our checked-in luggages/bags and sometimes steal important belongings? I do, this is the reason why it keeps me from buying high-ticket items and bringing it here because aside from paying taxes from the customs, I’m afraid it might get lost in transit too. I’ve read about stories that their luggages have been slashed and airport authorities just can’t point on who’s responsible for that. Well, now there’s a solution, Protectabag. I saw this at the NAIA Terminal 3 just beside the Travel Tax payment counter. They will wrap your luggage/boxes with cling wrap generously. 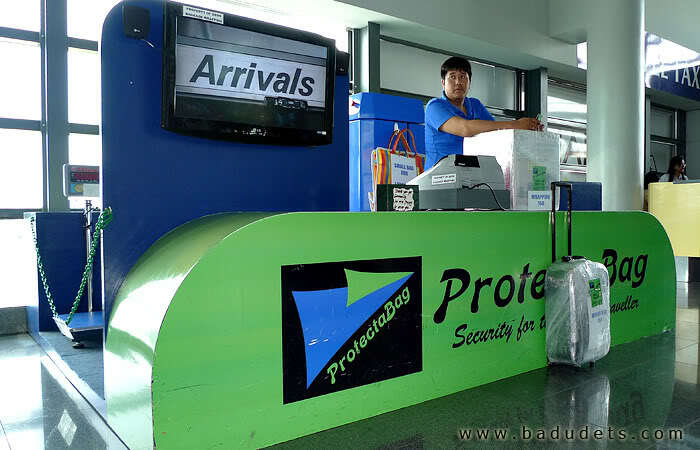 Can Protectabag ward off those #laglagbala syndicate in NAIA?